Vacationing in the "Land Of A Million Smiles"
Editors' note: Bob Besom, Director of the Shiloh Museum, Springdale, Arkansas, kindly offered the following document to Ozarks Watch for publication in this issue. Vacationing in the "Land of a Million Smiles" was previously published as an occasional paper by the Shiloh Museum. A shortened version of that paper is presented here. The young Miss Dodds' 1926 destination, Monte Ne in Benton County of northwest Arkansas, was an unusual resort indeed, an idiosyncratic expression of the famous William "Coin" Harvey. Harvey was attracted not only by the idea of free coinage of silver, but also by the mystique of pyramids. The pyramid he started at Monte Ne was a tourist attraction visited by Miss Dodds and her party. It is now under the waters of Beaver Lake. 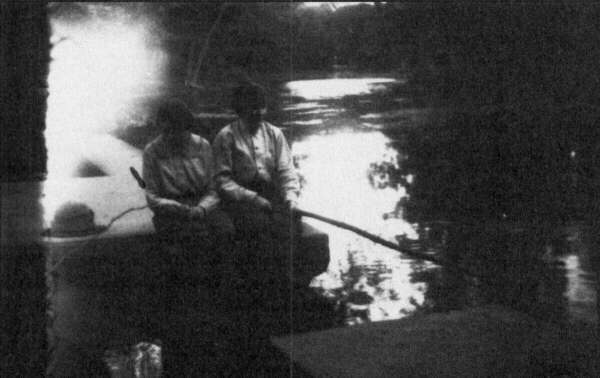 On August 9, 1926, Evelyn Dodds, her older sister Lessie, and their mother Henrietta left Pine Bluff, Arkansas by automobile for a two-week vacation in the Ozarks. 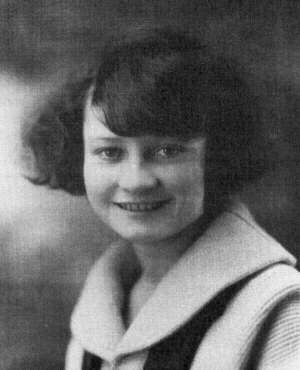 Evelyn was 19 years old and the only driver among them. The auto was a Ford Coupe which the sisters had borrowed from their brother, Homer. It had only enough room for three people on its single seat, so they had to leave the rest of the family at home. The three stayed over at Dover and Eureka Springs enroute to their destination, Monte Ne, near Rogers. They stayed at Monte Ne for eight days. Lessie was the one "on vacation." Each year she got two weeks off from her job of assistant cashier of a Pine Bluff bank. As she explained, she worked hard at the bank and her vacation was a time for rest. Evelyn is my mother and she mentioned parts of the trip to me from time to time when I was growing up (especially burning out brakes going down the mountains into Jasper?) Not long ago I was tickled to discover in a box of old family photographs at Lessie's home, Mother's handwritten notes and journal covering the trip. The journal, which Mother barely remembers writing, is offered here because it serves to illustrate some of the themes the Shiloh Museum emphasized in its summer 1988 exhibit on tourism in the Ozarks, "Land of a Million Smiles." The journal has been transcribed just as mother wrote it, except that abbreviations have been spelled out to make it easier to read. Mamma, Lessie and I left home about 6:20 and arrived in Little Rock about 8:45. After going to the office to announce our arrival to Homer and finding a good beauty parlor (where Lessie could get a permanent) Mamma and I succeeded in getting a few trivial articles for Lessie to complete our traveling trouseau. These were found at the Bruce Ellis drugstore. During the time Lessie was "sitting in torture" Mamma and I went to see Mrs. Barber. By the time we returned to the "Golden Mirror" it was time for lunch. Mamma, Homer, and I went to a cafeteria while Lessie was perambulating around doing some shopping. At 1:30 we left Little Rock expecting to spend the night in Russellville, Arkansas but owing to the splendid roads etc. we went on to Dover Ia small village at the edge of the Boston Mountains] 10 miles from Russellville. Russellville was too hot and dirty-looking anyway. We spent night at Dover Hotel. It was a very old fashioned house. We did not like it very much. We slept on sleeping porch (or rather stayed on one during night), but it being the night before the election we did not sleep. Left Dover about 7:00 for Jasper (over the backbone of the Ozarks). There were several who tried to discourage us but we were not to be stopped. Up the mountains down and up again. The roads were good, except for the rocks. The "hair pin curves" were a sight to look forward to and when I saw the first one I was almost too excited to go around it. The scenery was such that I would not attempt to describe. I regret that I am not an artist that I might attempt to paint some of the scenes. 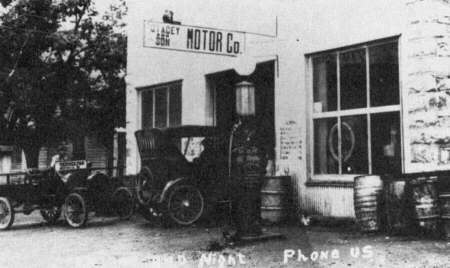 By the time we reached Jasper the brakes were burned out and had to stop at garage to have repaired. Garage man drove us to Murrays Hotel where we stayed until the car was fixed and also had lunch. Owing to expense and time we did not go to Diamond Cave, but started for Eureka Springs about 1:30. We had a lovely trip, roads fine, but had one blow out. This was experience for Lessie and I since we had never tried to change tire. We had both tires off and were trying to put one on when two men and a lady stopped and helped. We were delayed about 40 minutes. At Green Forest had the tire vulcanized. Garage men very friendly and one of them reminded me of someone I know?? O! Boy! Arrived at Eureka Springs about 7:00 and got a room in Thach Hotel. Ate dinner in traveling clothes. Slept very good all night. Had breakfast and went sight seeing. It did not require very much time to see all there is in Eureka. We went to several springs, to Carry a Nation [sic] Cave, magnetic springs, and also went to roof garden of Basin Park Hotel to view the city. Eureka is a very small place. It is located on a mountain or rather on three shelves of the mountain. Main Street is on lower shelf. It is very rocky, crowded and somewhat dirty reminding me to a certain extent of Hot Springs. Dwellings and all buildings are so near street you think you are going thru them. There are many people there, but mostly travellers. Also went to Lake Lucerne, a few miles out from Eureka, and took a few pictures. By the time we got back to hotel it was time for lunch. Served lovely meals. Soon afterwards it began raining and thundering, but did not last long, so about 2:00 we left for Monte Ne (about 40 miles). The mountain drive was perfectly beautiful, more so than any we had gone over. It had only rained enough to make everything look fresh and green. Before we arrived at Rogers we had a puncture, but Lessie and I were more acquainted with tire trouble and did not take long to get good started. However, a nice-looking gentleman stopped and finished for us. He was from Missouri, so he said, and promised to follow behind us until we got into town. But, poor man, we lost him. It was raining when we got to Rogers, but we had tire fixed and came to Monte Ne, our journey's end. Got room on 1st floor of tower. Dressed for dinner, but went to bed early, at least as soon as everything was unpacked. So cool and pleasant we overslept and was late for breakfast next morning. After a most enjoyable breakfast, we rested for a while, wrote some post cards, and then went sight seeing. Lessie, having been here before, knew where to find places of most interest. We drove around the hotel grounds, saw swimming pool, dancing pavilion. Girl Scout Camp, new tomb (King Tut) being built, and the panorama. The panorama was beautiful and could see the White River which, from where we stood looked like a stream of water. To the left we could see a rock called "Devil's forehead." Going from there we got on wrong road and went back to Rogers. There we left a tire to be vulcanized. 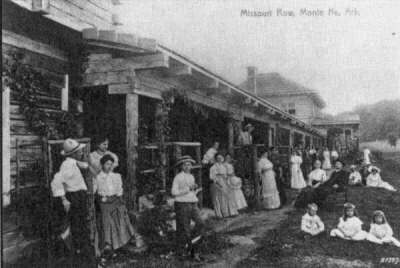 When we returned to Club House Hotel at Monte Ne, a family had moved into adjoining room. Dr. and Mrs. Ackers and little girl (Corrine) from Aberdene, Miss. Perfectly lovely people. A few minutes later I was invited to play bridge with Mrs. Ackers, Mrs. Barrett and Priss. Mrs. Ackers and I won. It was then time for lunch, after which I do not recall anything time to dress for dinner, because that is the time they all go to same place (to Slumberland). After dinner we sat on porch of hotel where we met the two Miss Metzkers, Mrs. Carnegie, and daughter. Several boys at hotel tried to stir up a dance but no one responded except the little children. A bunch of us talked until 9:30 then we retired. Slept to camp life music. Croaking of frogs, hooting of owls, birds and crickets chirping. After breakfast we drove to Springdale, Lowell, and Rogers. We stopped at several places trying to get some fruit but did not succeed until we got to Rogers. Lessie got some at Mr. Elders' Grocery Store. Had a bolt put on frame for extra tire and got the tire we left the day before. Returned to Rogers and Mamma and I played bridge on porch with Messrs. Barrett, Barron, and Priss. Raining. Grand morning to sleep. Was late to breakfast as usual. Mr. Wayne threatened to fine 25c every time we came in late. After eating we returned to room and Mama and I embroidered while Lessie read. We continued this until noon except when I went after mail. Rested after lunch and about 4 o'clock drove into Rogers for Lessie to get shampoo. Parked car and went into art shop where I had a lesson in making picture frame. Bought a beautiful picture and frame to be clayed. While I was learning this art, Mama and Lessie went to show (couldn't get in at beauty parlor). I got out before they did and sat in car. Returned to Monte Ne in time to be late for dinner. Mr. Wayne took it out on me and teased me lots about being so noisy. After dinner we sat on hotel porch for a while after which we went to old fashioned square dance a few blocks from hotel. Old time "fiddlers" played old time music thruout dance. Benches were built all around platform on which to sit. The crowd gathered early, but dancing did not begin until 9 o'clock. Owing to scarcity of women we were all asked to be a partner, but our ignorance of the dance kept us from responding. Miss S. Metsker, however, danced 1st set. It was very amusing indeed but I couldn't understand what Jim said when "calling off sets." This verse is all I recall--"Fry ham make gravy, nobody home but Charlie and baby." We left early but the crowd was still gathering. I suppose those folks look forward to such for weeks. They were all dressed in work clothes--men in overalls and women in house dresses. Most of the women had babies in arm or tagging on skirts. This prohibited most of them from dancing. Mamma and I were late to breakfast--Lessie stayed in bed. We all read all morning except while I was chasing after water. Light and H20 were cut off so I had to go down hill to spring for H20. Read and slept half of afternoon and then got up and washed hair and took bath after water was turned on. After dinner Mrs. B. and I played games out on lawn for quite a while. We then sat and talked on lawn where I met Mr. and Mrs. Mayfield. After I went in on porch where Mama and Lessie had been all evening, we talked and laughed again while the children played and fussed over my uke. I played a little on uke and piano. The G. boy came over and talked to me and asked me to play croquet next day. Thundering and lightening--cool and good night to sleep. About 40 minutes late for breakfast because I was slow and had to dress Mamma's hair. After breakfast sat on porch for while after which Lessie, Mrs. Roane, son Frank, and I went to Rogers. Mrs. Roane and Lessie had shampoo and I painted picture frame at Art Shoppe. After I finished went back to car and waited for Lessie and Mrs. R. for 1 hour and 30 minutes. Frank was there. He and I played "Snap" a while then decided to go to vinegar factory. We did not see the vinegar made but saw the bottles washed, filled, corked, labeled, wrapped, and cased up. This is the only vinegar factory in Arkansas and possibly largest in U.S.
We returned to Beauty Shop and met Lessie and Mrs. R. Drove out several different roads trying to find wash woman. Finally succeeded and came on back to Club House and was little late for lunch. After lunch slept and read. I talked a little to E. G. Also wrote in diary. Bought cards and E. gave me some C. House paper to write letters. Started writing and Dixie came after uke. By this time we had to dress for dinner after which we sat on porch and talked. Rained most of night and had to sleep under blankets. It was raining when we got up and continued off and on all day. Nothing to do but write letters--sleep--read and sew. Engaged horses to go riding with Frank Roane and Louise Hillyer for next day. Raining again--continued all morning and didn't go horse back riding. Stayed in hotel lobby. Talked and flirted. Also went to see Mrs. Roane in her room upstairs. After lunch Mamma and I embroidered and Lessie read and slept awhile. About 3 o'clock we drove to Springdale to Annual Grape Festival. Between Rogers and Springdale the road was lined with cars coming from festival. We got there about 4 and owing to the rain for several days the read were slippery. There were estimated to be 35,000 visitors there that day. Baskets of grapes were mailed to friends by request, but we could not find them. There were from 7 to 10,000 baskets mailed that day. One basket went to Italy. We arrived in time to see the end of the pageant. Stopped car on side of road just in front of platform which was about I 1/2 blocks away. We could see but could not hear. Costumes and dancing were beautiful. Different grape countries were represented. The streets were roped and we had to wait for traffic to calm down before we could get by. Never did see so many cars in a small place before. When we got back to Rogers went to Mr. Elder's Grocery store to see him. Miss M. Gaunt and niece Janice from Pine Bluff were there and Lessie asked them to come to Monte Ne with us. They did. 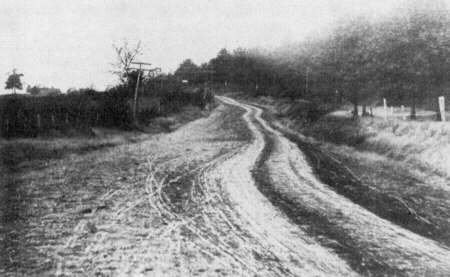 Typical of the "splendid roads" driven by the vacationers.